~Punch Nigeria. Friday, March 9, 2018. The process for his deportation was set in motion eight years ago when a judge ruled that he had overstayed his visa. Buba Jabbi, 41, of Wisconsin Rapids was deported Tuesday and back in The Gambia by Wednesday afternoon, according to a U.S. Immigration and Customs Enforcement statement issued Wednesday. Jabbi had entered the U.S. in 1995 and overstayed his visa. He was detained February 15 after checking in with federal authorities as he had been directed and was set for deportation based on a judge’s order from 2010. A stay of removal had been filed on his behalf, but was denied February 27, according to Nicole Alberico, a public affairs officer with ICE. Jabbi, the father of two daughters ages five and one, was being held at a detention centre in Sierra Blanca, Texas. 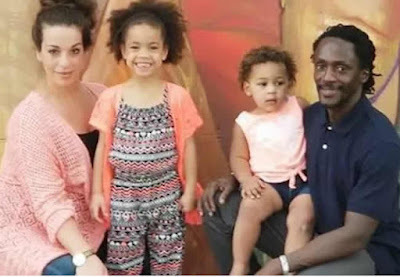 If necessary, Jabbi’s wife, Katrina Jabbi, a native of Wisconsin Rapids, said she would move her family almost 5,000 miles to The Gambia, a nation of about two million people that is almost twice the size of Delaware, to be with her husband. “We have spent many years trying to rectify this situation,” Katrina Jabbi previously said. “I will continue to fight and file waivers if he is deported. Katrina Jabbi married Buba Jabbi in 2013, four years after meeting him. The couple has two daughters, Nalia, five, and Aisha, one; and they are expecting a third child in October. Katrina Jabbi said she works part time from home and moved back to Wisconsin Rapids, about 135 miles northwest of Milwaukee, to be closer to her family. Her husband had been working as a truck driver. He came to the United States in 1995 on a temporary travel visa to attend the 1996 Summer Olympics in Atlanta, according to Katrina Jabbi. When he tried to change his status to allow him to stay in the U.S., the paperwork he filed was incorrect and his case was moved into removal proceedings, where he remained for several years. However, Buba Jabbi was considered “undeportable” because his country would not provide travel documents on his behalf, she said. Instead, he was given orders of supervision, requiring him to report to immigration once a year and obtain work authorisation, which he had done for the past 10 years. Buba Jabbi was at his annual appointment February 15 in Milwaukee with immigration officials when he was detained and told he would be deported, his wife said. The statement from ICE said his travel documents from The Gambia had been validated. Buba Jabbi still has family in Gambia. Despite being separated from him, Katrina Jabbi said she is happy her husband will be able to see his parents for the first time in more than two decades.